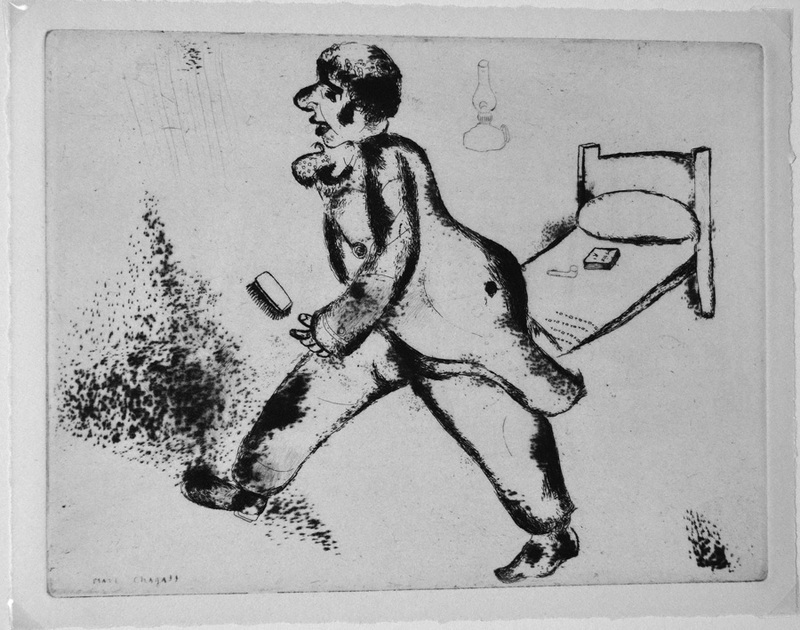 Chagall did not begin making etchings until 1921. 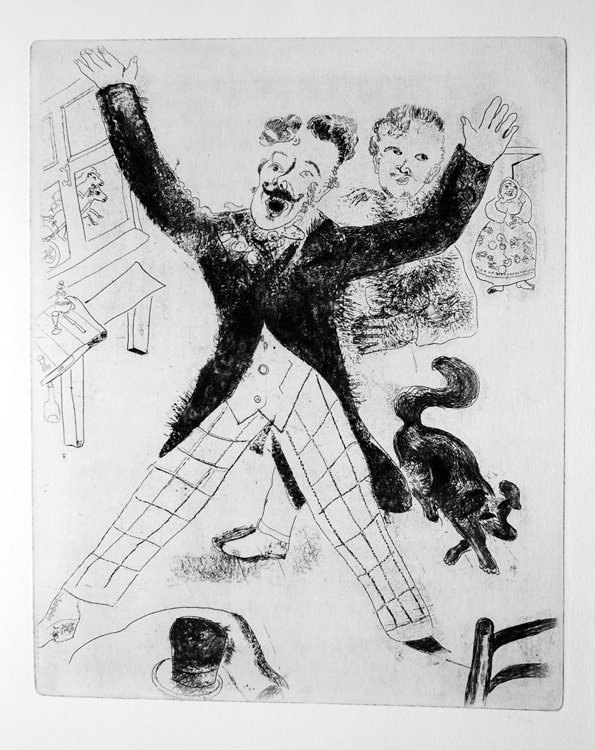 After his return from Russia, he first tried his hand at etching in the prints he executed for his autobiography, My Life (Berlin, 1922-23). Moving to Paris, Chagall was approached by Ambroise Vollard, who wished to commission him to produce a set of etchings for a deluxe "livre de peintre" like the ones Vollard had already commissioned from Bonnard and Rouault. Chagall rejected Vollard’s choice of texts and instead suggested Gogol’s Dead Souls. The result is one of the masterpieces of modern art. Jean Adehmar’s brief summary in his Twentieth Century Graphics gives us some keys for entry into the work: "the numerous figures in profile show astonishing types; the Expressionist influence is very noticeable and the Russian atmosphere is admirably rendered." The characterizations of the people Chagall presents us are so striking that we instantly recognize them not simply as portaits of individuals but as representatives of the human comedy that so much of Chagall’s art illustrates for us. Nor is this effect diminished upon further viewing; rather it is strenghtened the more familiarity we gain with the images. 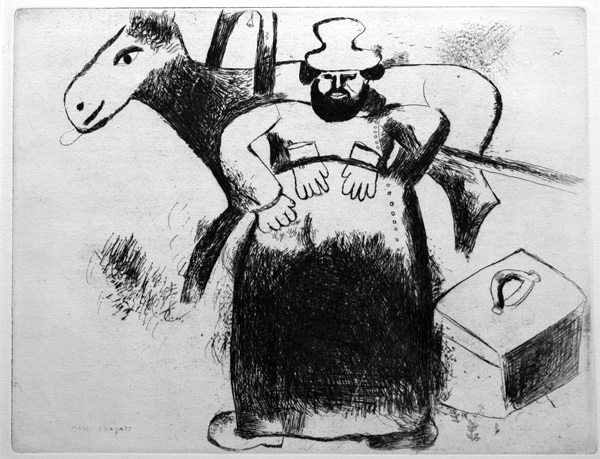 As Franz Meyer has observed in Marc Chagall: His Graphic Work, the etchings paint a much larger mental canvas than mere individual types, showing Chagall’s "native Russia with its wind-swept vastness and, for all its bitter misery born of unreason and inertia . . . its inexhaustible, wholesome, joyous vitality as well." While there is satire and mockery in these plates, there is also acceptance and even love of the whole of human experience. As Meyer notes, "This entire world of stupidity, malice, and selfishness is rendered transparent through humor. . . . The basic incongruence of reality and appearance is so pointedly brought into relief that magnificently comical figures result. But this comedy is not a hostile satire or a pitiless record of these characters, with their weaknesses and their baseness. It is a liberating force which discloses the deep stream of exuberant life behind all the figures in the novel. Everywhere, running through all the comical elements, and borne along by a sort of inner joyfulness, there appears the fantastic, rich, inexhaustible reality of Russian life." 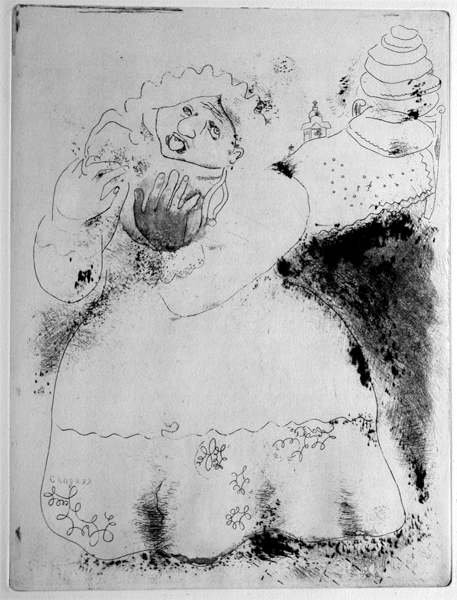 Although the surface details of the etchings may be drawn from the Russia to which Chagall is so affectionately saying farewell, one realizes that Chagall’s affirmation of the whole of lifefolly as well as brilliance, selfishness as well as altruism, fear as well as love, the surface illusions as well as the inner truthshas a relevance as universal as Shakespeare’s comedies or Joyce’s Ulysses. Robert Marteau ("Chagall as Engraver") has wisely insisted on this dimension of Chagall’s art, so strongly transcending its Russian origins, when he notes of the Dead Souls etchings, "Observation is what feeds this verse always. Nothing is set, nothing fixed: people and objects take life under the graver without our expecting it to happen, and their geste follows its course under our gaze amid the tribulations, joys, and jokes that each new day brings. We always feel how greatly life delights him, but Chagall adds a dimension to the fleeting manifestations of life that he seizes, and this extra dimension puts the work far above any mere realism limited to particular situations." 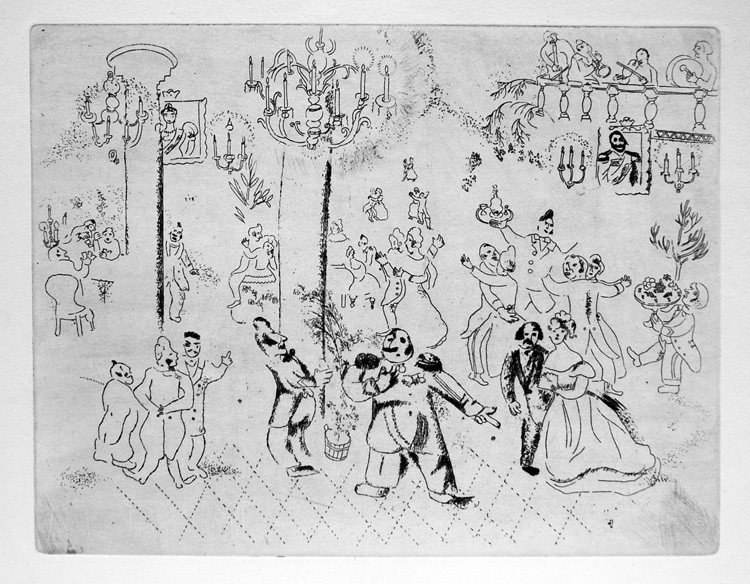 Thus in looking at such etchings as "The new chief at the Treasury," "On route to Sobakevitch’s house," or "Tchitchikov and Manilov meeting in their overcoats," one notices first such details as the Russianness of the dress and of the landscape (including the quintessentially Russian troika which carries Tchitchikov to Sobakevitch’s), but then the universality of the depicted scenes takes over, and we find ourselves focusing more on the scurrying clerks whose new boss has just tried to terrify them into submission to his regime or the fantastic conversation between the coachman and the center horse whom he is accusing of loafing while his two fellows do all the work (and in so doing offers the horse the opportunity to laugh at him for thinking it within his power to make it work any harder and for providing the horse with an excuse not to work until the conversation has ended), or even the jostling and sparring for position between the two heavily clothed bargainers, each keeping his true position as hidden as his overcoat keeps his body bundled up and hidden from the winter’s cold. Once we have entered into this world of universal truths, we are freed to respond to the visions of the human comedy that inform the contrast between the painters’ joyous abandon and their employer’s terror in "The house painters," Madame Korobotchka’s extravagantly mixed emotions as she provides pillows for her unexpected guests, or the surrealistic vision of the clerks merging with their desks in "The registry of deeds." The Dead Souls etchings allow us to witness clearly to this first explosion in graphics of Chagall’s tremendous affirmation of life and in so doing define themselves as one of the masterpieces of twentieth-century printmaking. Select Bibiliography of Chagall's Prints: Franz Meyer, Marc Chagall: His Graphic Work (NY: Abrams, 1957; Meyer was Chagall's son-in-law and author of the massive Life and Works which is still the standard catalogue raisonné of Chagall's paintings); Sylvie Forestiere, ed. Marc Chagall: L'oeuvre gravé (Nice: Musée National Message Biblique Marc Chagall, 1987; abbrev. Nice 1987); Jean Adhemar, Chagall: L'oeuvre gravé (Paris: Bibliothèque National, 1970; abbrev. BN 1970); Irina Antonova, et al, Chagall Discovered From Russian and Private Collections (NY: Levin Associates, 1988; abbrev. Moscow, 1988); Ernst-Gerhard Güse, Marc Chagall Druckgraphik (Westfalen: Westfälisches Landesmuseum für Kunst und Kulturgeschichte Münster, 1985); Udo Liebelt, ed. Marc Chagall Druckgraphische Folgen 1922-1966 (Hannover: Kunstmuseum Hannover, 1981; abbrev. Hannover); Roger Passeron, Mâitres de la gravure: Chagall (Paris: Bibliothèque des Arts, 1984); Charles Sorlier, Marc Chagall and Ambroise Vollard: Catalogue Complet des gravures exécutées par Marc Chagall á la demande de Ambroise Vollard (Paris: Editions Galerie Matignon, 1981). La soirée chez le gouveneur / Evening fête at the Governor's house (Hannover 43, Sorlier 5). 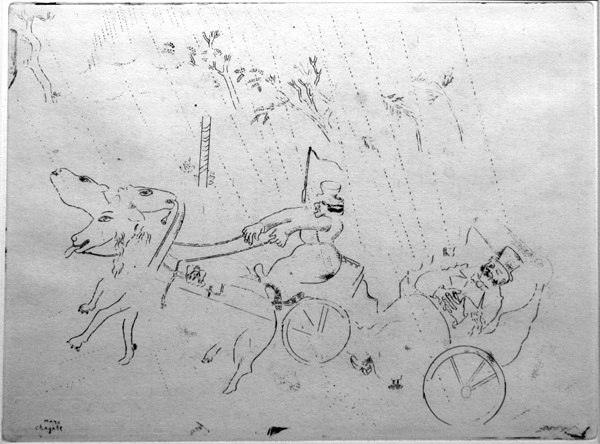 Original etching with drypoint, 1923-27. 335 unsigned impressions + 33 HC. No pencil-signed impressions exist. Inclulded in the 1970 BN show and the 1987 retrospective of Chagall's prints at the Musée National Message Biblique Marc Chagall (Nice). Image size: 223x287mm. Price: $5000. Petrouschka (Hannover 44, Sorlier 6). Original etching with drypoint, 1923-27. 335 unsigned impressions + 33 HC. No pencil-signed impressions exist. A very strong impression, slightly trimmed in the margins away from the image. Illustrated in Ernst-Gerhard Güse, Marc Chagall Druckgraphik (Stuttgart: Hatje, 1985) in the catalog for an exhibition of Chagall's prints at the Westfälisches Landesmuseum für Kunst und Kulturgeschichte Munster (the book illustrates 33 of the 96 etchings in the Dead Souls), 1970 BN show. Image size: 223x287mm. Price: $5000. Selifan (Hannover 45, Sorlier 7). Original etching, 1923-27. 335 impressions signed in the plate + 33 HC. No pencil-signed impressions exist. 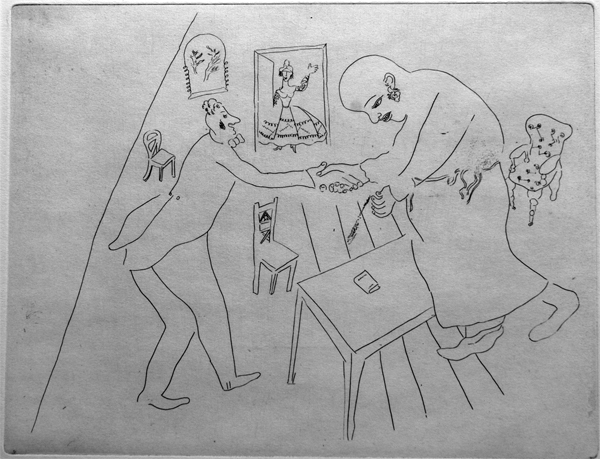 Chagall's etchings for Gogol's Dead Souls are among his earliest etchings. They are also some of his finest. Illustrated in Franz Meyer, Marc Chagall: His Graphic Work (NY: Abrams, 1957), Meyer Chagall's Graphic Works, Wesfalen 1985, the 1987 Moscow Chagall exhibition, and the 1987 retrospective of Chagall's prints at the Musée National Message Biblique Marc Chagall (Nice). Selifan is a rather rascally figure who believes in self-indulgence and would rather party than work. Image size: 221x286mm. Price: $5000. On the way to Sobakevich's (Hannover 46, Sorlier 8 ). Original etching, 1923-27. 335 impressions signed in the plate + 33 HC. No pencil-signed impressions exist. Illustrated in Franz Meyer, Marc Chagall: His Graphic Work (NY: Abrams, 1957), the Chagall retrospective at the Bibliotheque National (1970), the 1987 Moscow Chagall Exhibition and the 1987 retrospective of Chagall's prints at the Musée National Message Biblique Marc Chagall (Nice). . Image size: 219x287mm. Price: $6000. 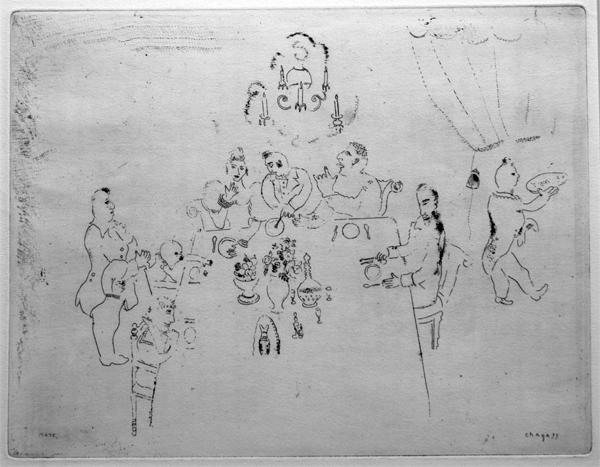 Repas chez Manilov / Dinner at Manilov's house ( Hannover 49, Sorlier 9). Original etching with drypoint, 1923-27. 335 unsigned impressions + 33 HC. No pencil-signed impressions exist. Inclulded in the the Chagall retrospective at the Bibliotheque National (1970). Image size: 223x287mm. Price: $5000. Tchitchikov's farewell to Manilov (Hannover 51, Sorlier 12). Original etching, 1923-27. 335 impressions signed in the plate + 33 HC. No hand-signed impressions exist. Illustrated in Meyer, Chagall: His Graphic Works (NY, 1957), Wesfalen 1985, and in the 1987 Moscow Chagall Exhibition. Image size: 218x284mm. Price: $5500. Madame Korobotchka (Hannover 54, Sorlier 18). Original etching, 1923-27. 335 impressions signed in the plate + 33 HC. No pencil-signed impressions exist. Illustrated in the Bibliotheque National show of Chagall's graphics; illustrated in Meyer, Chagall: His Graphic Works, (NY, 1957), and Passeron, Maitres de la Gravure: Chagall. Image size: 285x212mm. Price: $5000. Nozdriov (Hannover 61, Sorlier 23). Original etching, 1923-27. 335 impressions signed in the plate + 33 HC. No pencil-signed impressions exist. Included but not illustrated in the B.N. 1970 exhibition of Chagall's graphics, the 1987 retrospective of Chagall's prints at the Musée National Message Biblique Marc Chagall (Nice), and Moscow 1987. Image size:280x215mm. Price: $5500. 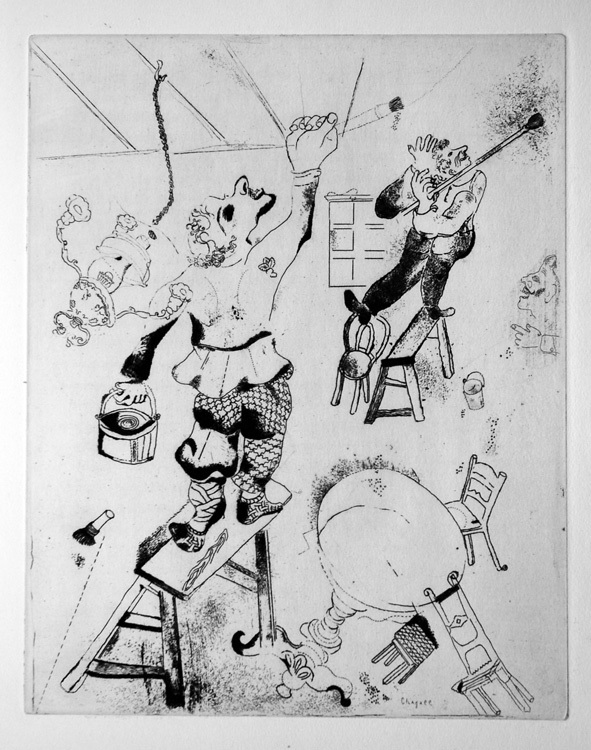 The house painters (Hannover 62, Sorlier 22). Original etching, 1923-27. 335 impressions signed in the plate + 33 HC. Signed in the plate right-center bottom. No pencil-signed impressions exist. Illustrated in Meyer, Chagall: His Graphic Works, (NY, 1957), Passeron, the Philadelphia Museum/Royal Academy catalogue, BN 1970, and the 1987 Moscow Chagall exhibition. Image size: 277x218mm. Price: $6000.